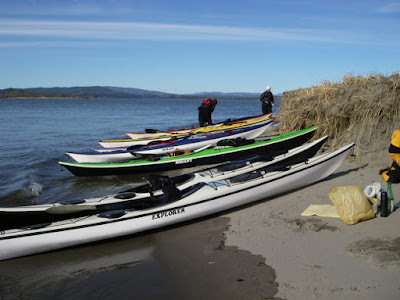 On a sunny Saturday in February a group of kayakers paddled from Astoria to Knappa Oregon via Miller Sands. There were seven of us: Jon and Kirti, Ron and Jodi, Jenny, Melody and I.
Jon Walpole planned this trip. The idea was to enjoy the open water on the lower Columbia and get a more "sea kayak" feel for the trip by paddling out to Miller Sands. The plan was to start in Astoria and use the flood current to help us on our way to Miller Sands and thence to Knappa. The flood started appr 11:30 in Astoria (Tongue Point) and slack before ebb was at appr 3pm and closer to 4:15 near Knappa. Winds were predicted to be SE 6 - 11 mph shifting to NE. Weather was predicted to be showers in the morning, clear the rest of the day. So a pretty good forecast for a day out on the Columbia. We got on the water at appr 11:40. The day was clear and there was a good breeze blowing at the East Basin Boat Landing where we set off (appr 10 - 12 kt). Our plan was to round Tongue Point and pause to re-evaluate once we saw what the winds were like for the more open water part of our trip. If the winds were too strong we could choose to meander through the sloughs to get to Knappa, or of course turn back if need be. The current was already flooding when we set off. We made good time to Tongue Point. The winds weren't bad at all. We rounded the point and stopped for a few minutes to do a bit of navigation to determine what landmarks we would use to paddle to Miller Sands. I'd never been to Miller Sands and at that distance I couldn't see them. I could take a compass bearing, but couldn't see where the west end of the sands were. I could see Rice Island and the SE part of Miller Sands that has trees. We figured out points we could use for navigation and set off on our crossing to Miller Sands. The crossing felt great. It did have a very "open water" feel about it. But since the weather was so nice we didn't have much in the way of waves. Very pleasant paddling. A beautiful day, a light breeze, sometimes very small waves. The flood current definitely helped us. Jon felt that we were sometimes moving along at over 4 kt. We then paddling along a few beautiful and relaxing sloughs to Knappa. The tide was high so the main sloughs were wide and the islands were full of little channels. Along the way we saw I think 7 bald eagles, a couple herons, and at one point flock of hundreds of ducks took off ahead of us making a sound like a thousand shower heads raining down on the water. Just stunning. 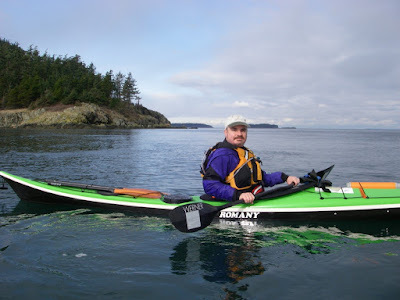 On Saturday, 2/16/08, Kristin and I paddled from Doe Bay around the Peapod Islands to Lawrence Point and back. We had beautiful weather: sunny, mid 50's, almost no wind. So the sea was almost like glass. We timed the trip to be heading east on the flood and heading back west to Doe Bay on the ebb. We saw a huge bald eagle on South Peapod, a number of seals, and a porpoise in Rosario Straight just off Lawrence Point. A very nice day to be on the water! We took a long weekend and went up to Orcas Island for Valentine's Day :) On Friday, 2/15/08 we paddled from West Sound through Pole Pass and around Crane Island. We got going later than we'd hoped to so we were paddling against the ebb current through Pole Pass, which was running at appr 2 kt at the time. Once we were through Pole Pass we didn't have much current against us. Then as we were heading east through Wasp Passage on the south side of Crane Island the ebb current helped us along nicely. We were the only kayakers we saw out that day, and nearly the only boats period. As we were paddling back near the mouth of West Sound the Coast Guard came by in an inflatable boat and checked on us. It was windy and rainy at the time and it was clear they wanted to make sure we could handle the conditions. Nice to have them out there. Weather: 40's, rainy most of the day, but we got a few periods were water wasn't falling out of the sky. Winds: S 10 kt (but sometimes we were in sheltered spots). 1 ft wind waves.